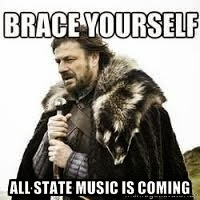 For students who want to begin practicing the Texas All-State band music before marching season begins, the link to this year’s audition material can be found here. Click on the “View Etudes” button. As always, I encourage my students to continue practicing a variety of other repertoire over the coming months. Practicing the same three etudes for half of the year can make your practice sessions stale so please feel free to mix it up with other etudes, solos, and of course fundamental exercises! Happy practicing!